I know everyone is gearing up for the winter holidays, but I'm still stuck in Fall and so are most of the trees in my San Diego beach neighborhood. I swear winter comes later and later each year. (I'm OK with that.) The trees and I believe that it's much more fun to sport colorful leaves than it is to be a bare branch. They provide me with color inspiration late into the season and I take their pictures (which I'm quite sure is like giving them a hug). 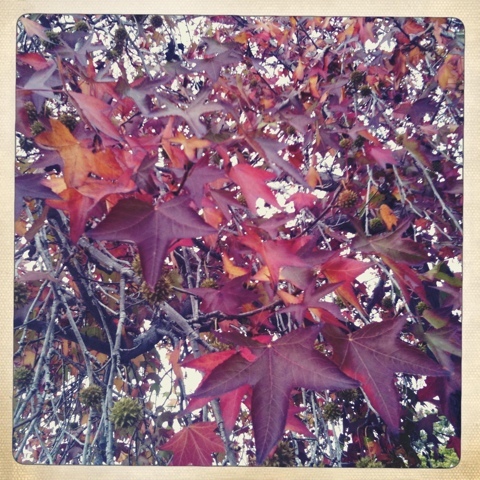 This tall lovely tree showed off it's golden yellows, oranges, pinks, reds, maroons and purples for me today.